NDOR oversaw the Yankton Bridge Project, a new bridge crossing the Missouri River at South Yankton, Nebraska, and connecting to Yankton, South Dakota. The bridge replaces the old Meridian Bridge, which was built in 1924 and served as a link between Nebraska and South Dakota for 84 years. 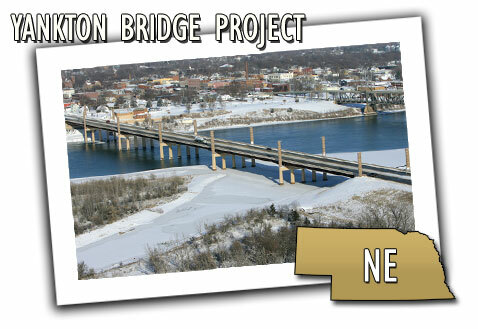 The old bridge will be converted by the community of Yankton into a pedestrian and bicycling path. The new $24 million, four-lane bridge spans the Missouri River at a length of 1,590 feet and is 74-feet wide. It crosses the Missouri over five piers and has 14 decorative 50-foot-tall spires that are wired for lighting and extend across the bridge from Nebraska to South Dakota. It is the first time the tower design has been used on a bridge. The project was completed one year ahead of schedule and came in under budget due to close cooperation between NDOR, their partners across the border in South Dakota, and the contractors and subcontractors involved in this project.